I mentioned in earlier posts that I am very lucky to have a wardrobe room. 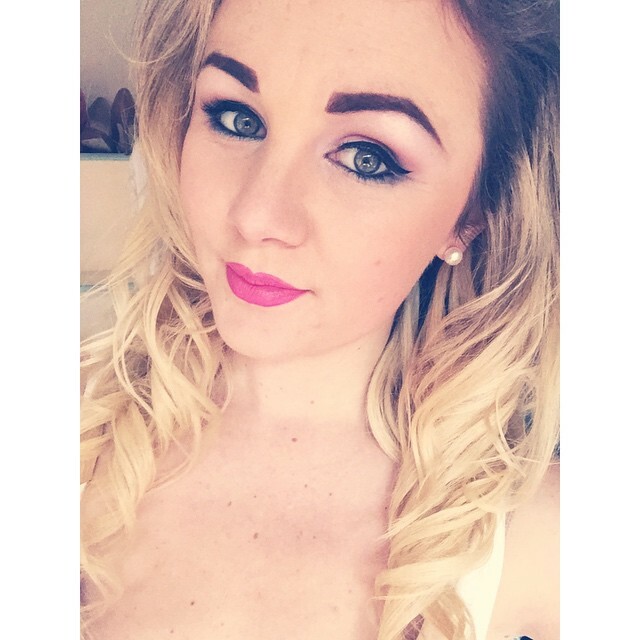 I have had lots of requests recently to share pictures on my wardrobe room. 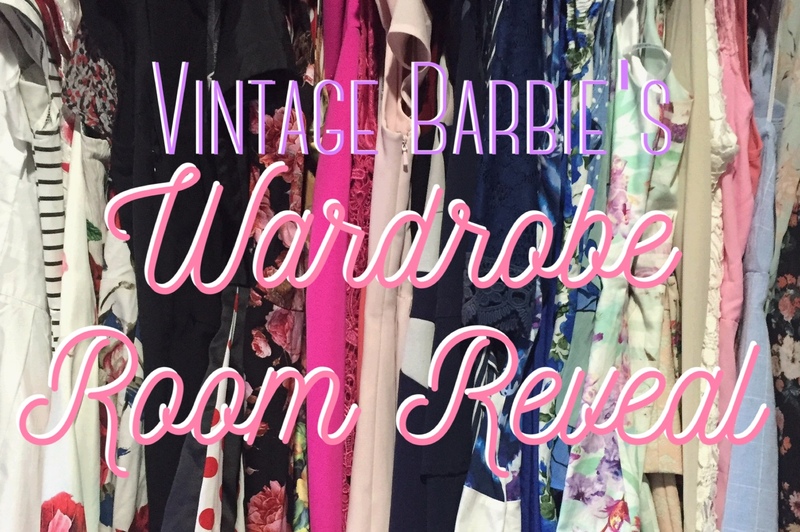 So today is the day I take you on a tour of my wardrobe! 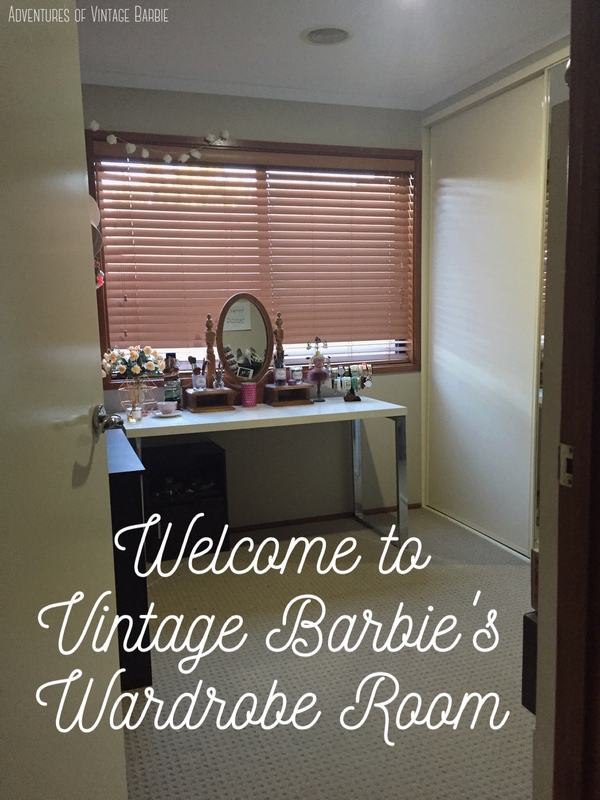 It is still a work in progress and there are some things I need to do, but it is definitely worth a post to show all my lovely readers my beautiful room as well as how I organise it. To the left of the room as you walk in you will see part of my vanities and jewellery displays. I have used two desks, set up in an L shape. 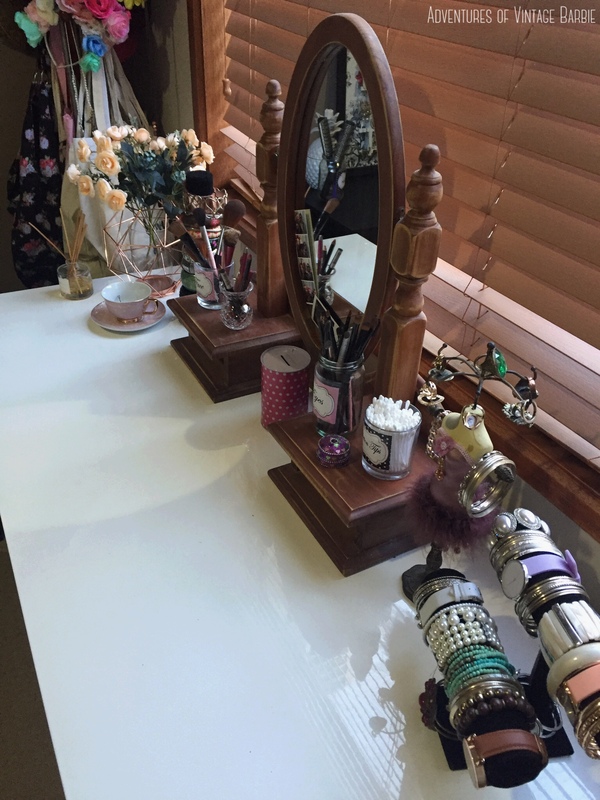 The white desk can be found at Officeworks and is my main vanity. It has a vintage wooden mirror but I have had this for so long I have no idea where it would be from. Underneath I have a small cupboard from Deals Direct that cost $14 and I use this to store the majority of my makeup. The espresso coloured study desk was $30 from Deals Direct and the small cube bookcase was $17 from Kmart. 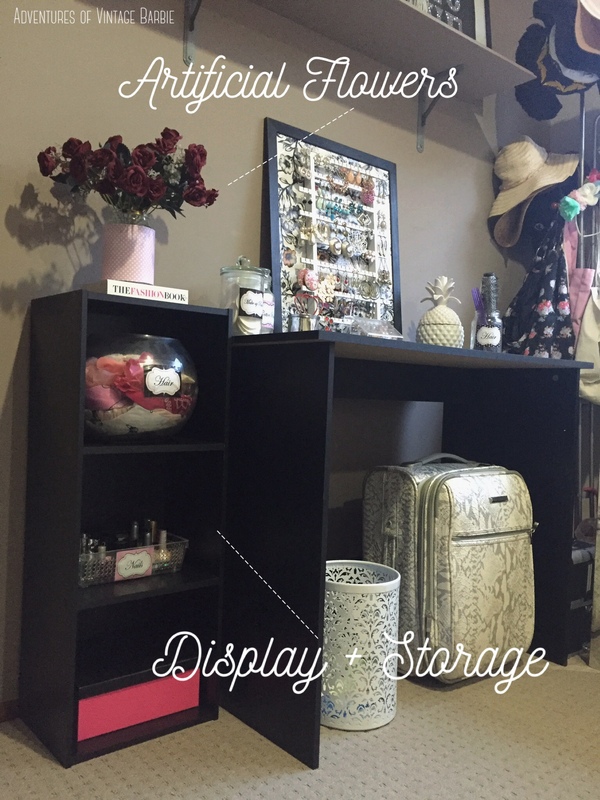 They are inexpensive ways I have used furniture and storage to make my dressing room. 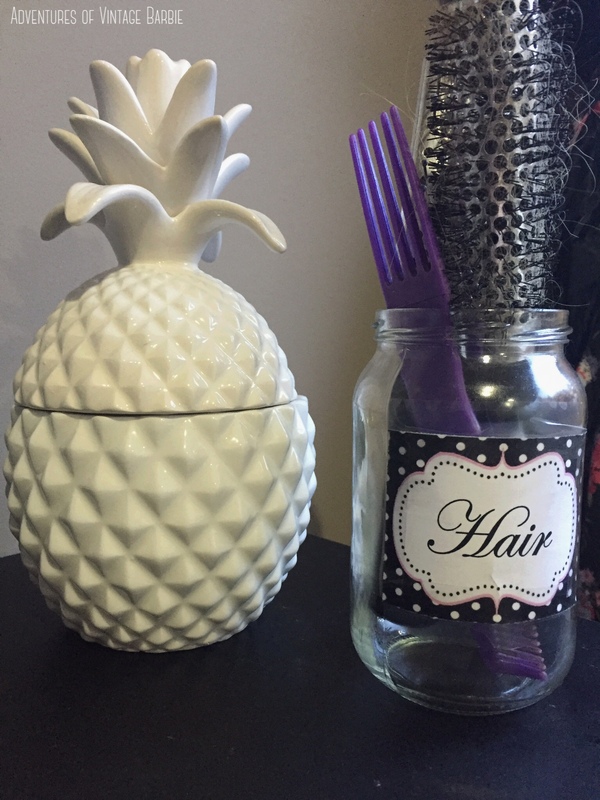 I have also made sure I used pretty decor like my DIY pink and white spot jar with artificial roses ($4 at the dollar store) and my white ceramic pineapple jar ($7 from Kmart) on top of the desk. I have styled my room with a budget in mind. 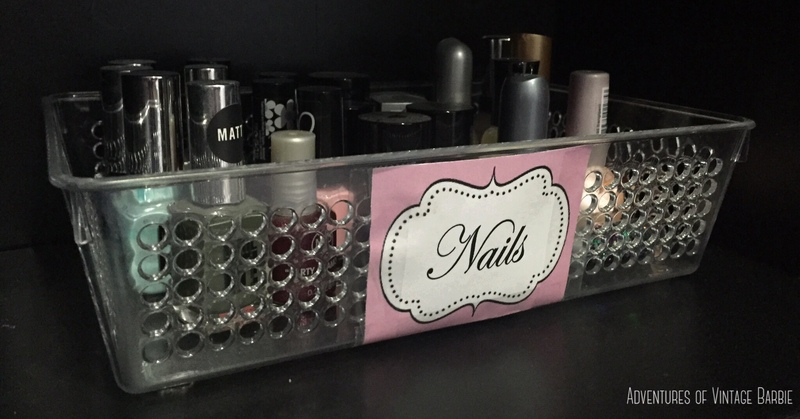 I have used a clear plastic container for my nail polish. This is bought from the local dollar shop for $2. I love that you can be creative when you have your own space. 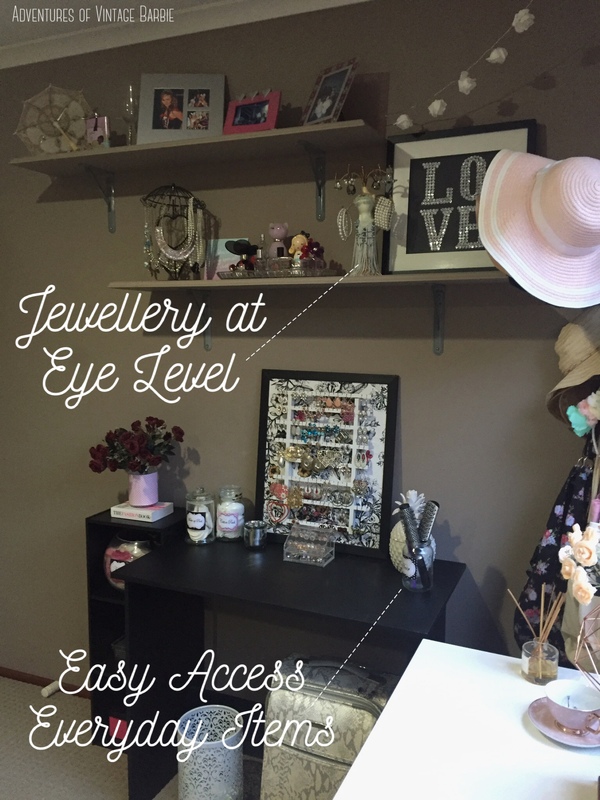 I display my homemade earring display on this desk and I also keep my stud earrings in a clear plastic storage container at the front of my large earring display. This earring display can be found at Howard’s Storage World. 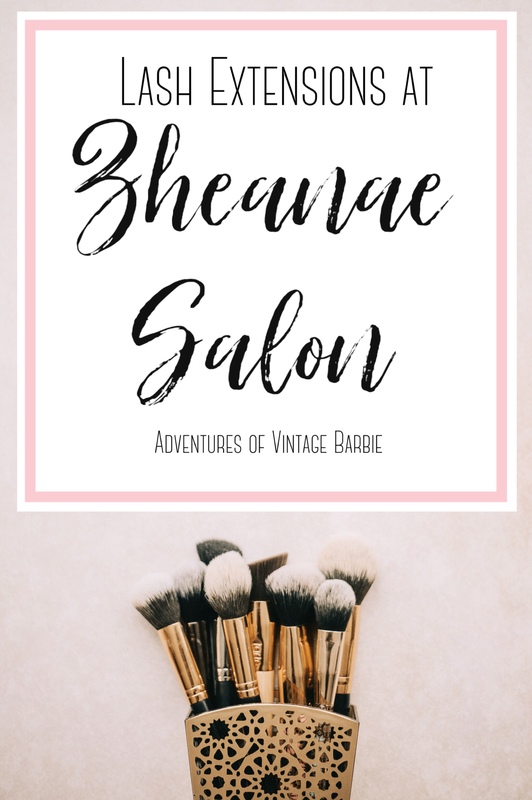 My hair accessories are displayed and stored in a glass fishbowl from the dollar store for $4. I have recycled old jars to use in this room, and decorated them with my own labels that I have printed out on the computer. 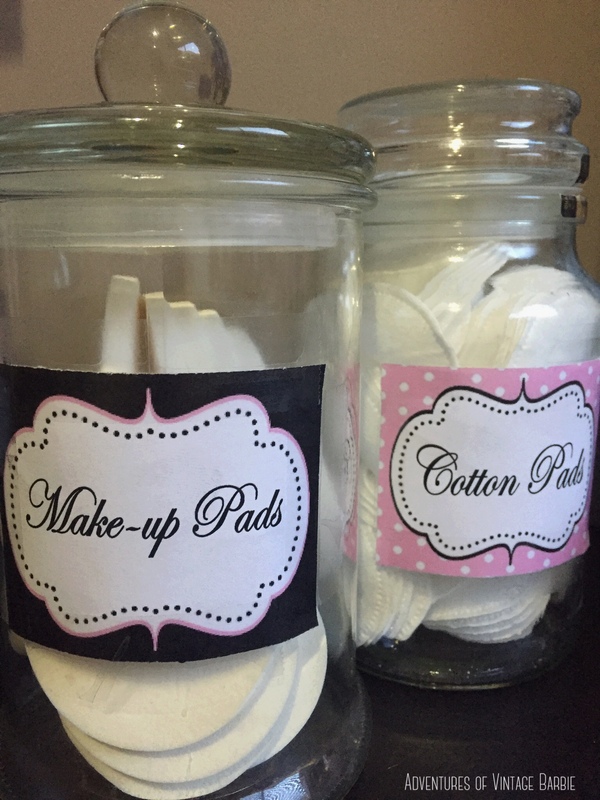 I have made sure they match my decor theme by having the labels pink, white and black. When we moved in the room already had two shelves on the wall that were placed in a mismatched way. The shelves were also painted the same colour as the walls. 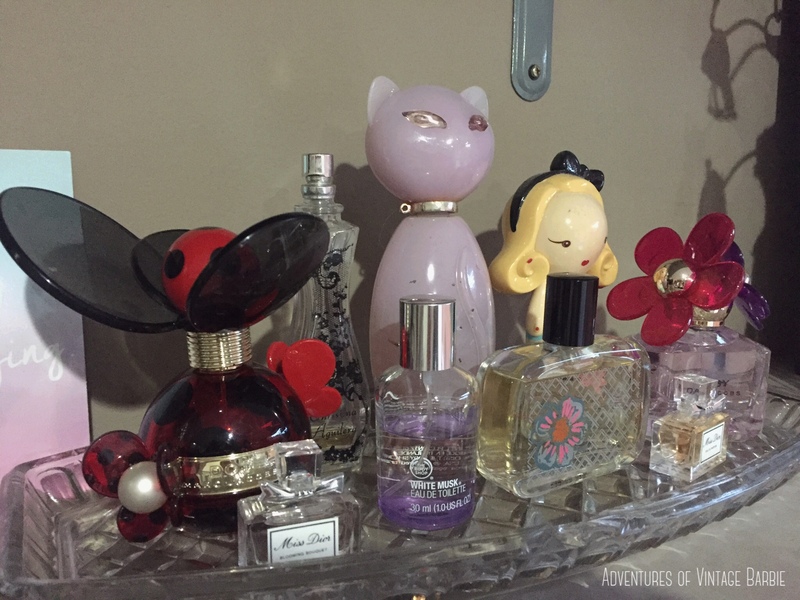 This is the perfect place to display my perfumes on a vintage glass serving tray. This tray was given to me from my mum, but I have seen similar trays at Op-Shops costing anywhere from $10 to $80. I put mainly decorative items on the top shelf such as some photo frames and this mini parasole I sourced off eBay for $5. I also have a pretty decorated champagne glass I received for my 21st birthday, and a vintage cartoon flask I received recently for Christmas. 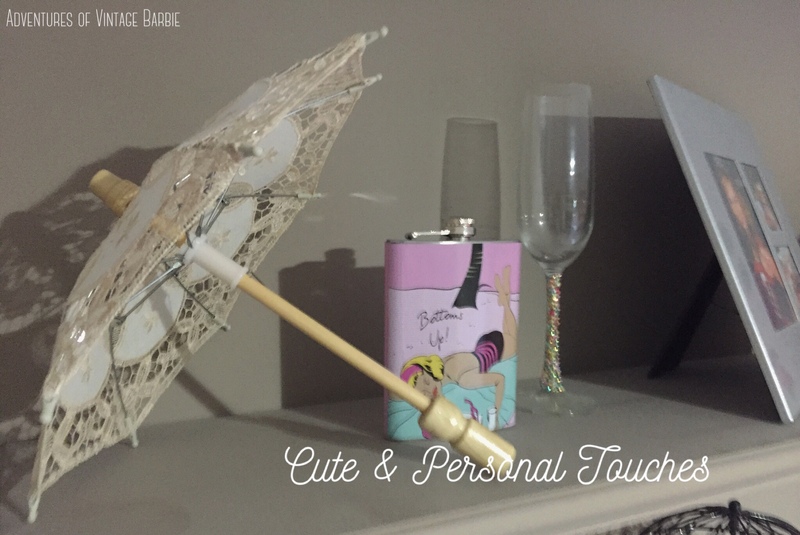 I am not entirely sure where the flask is from but you can purchase similar ones from Zazzle. This is my favourite corner of the wardrobe room. 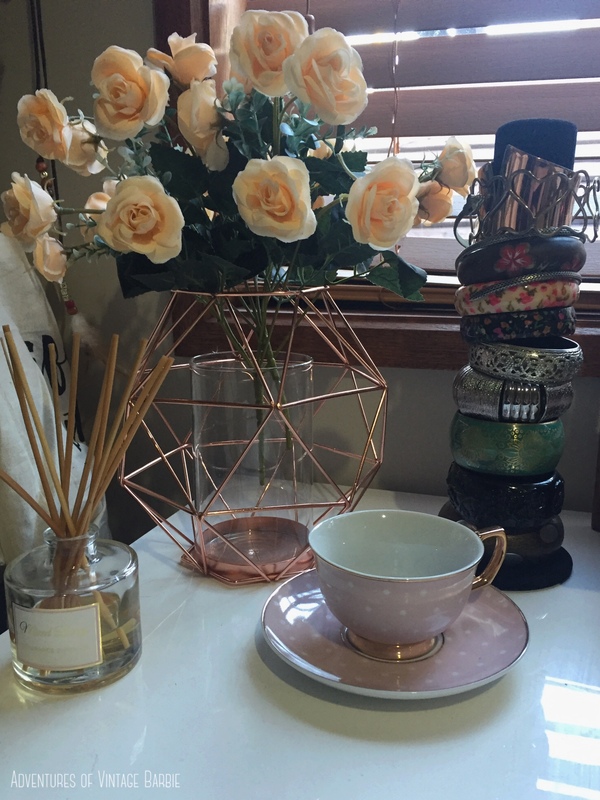 I absolutely love my geometric candle holder ($7 at Kmart) which gives my room a modern vintage look. I also love my cute blush and gold Cristina Re teacup and saucer combination ($34.95) This is the perfect place to discretely store loose bobby pins – No more losing all my bobby pins or having them scattered across my vanity! The diffuser is from Forever New for $20 and it makes my room smell like the artificial flowers are real! I also love my black bangle display which was sourced from eBay for $9. Another example of my vintage modern styling is the use of an old wooden vanity mirror on top of the modern white desk. I also have a beautiful small crystal vase from my Nan, which I like to use for storing my commonly used lip liners. 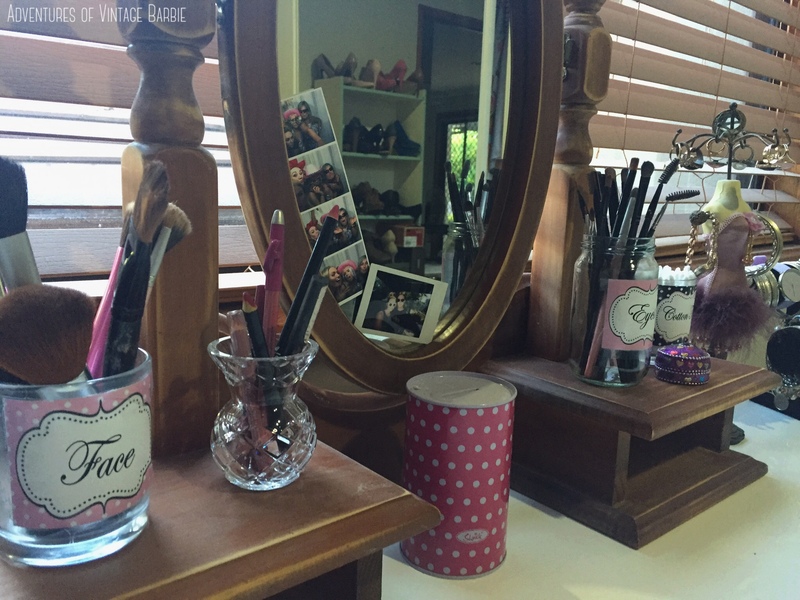 My makeup brushes are stored in recycled containers with matching labels I printed off. 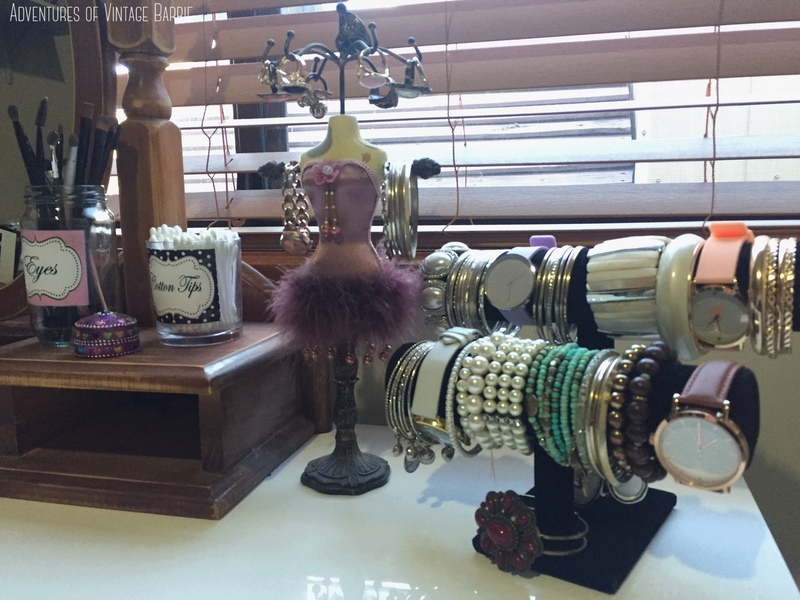 I always struggled to store all my jewellery items, but the two tiered bangle display looks perfect on my vanity desk. It was from eBay and cost $17. My mini standing mannequin is also a perfect little decorative piece that can also house all of my rings. This was a gift but I remember seeing them in trinket and gift stores for around $30 each or online for under $10 each. 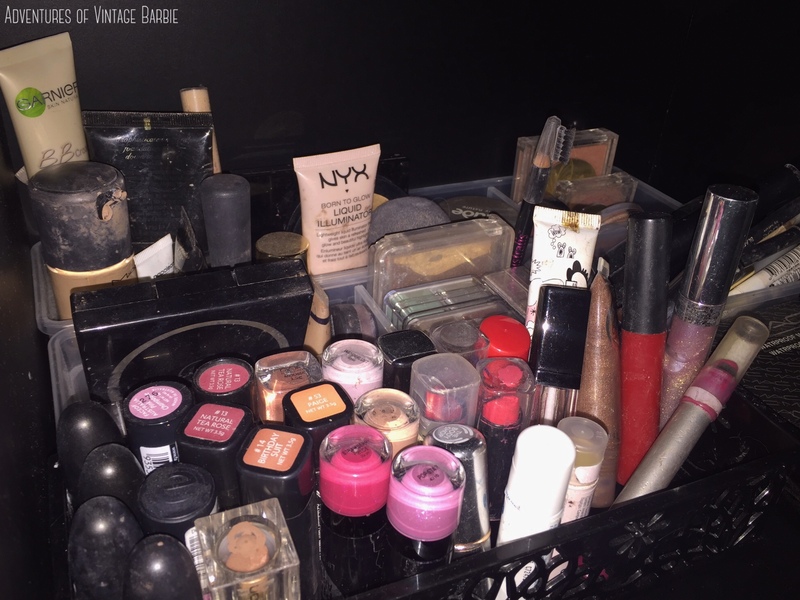 Makeup is stored in containers in a cabinet under the vanity. The containers were bought from the dollar shop and have plastic dividers in them, which makes keeping items organised a whole lot easier. Each container was $3 each. I hope to get some better storage in the future, but this will do for now. 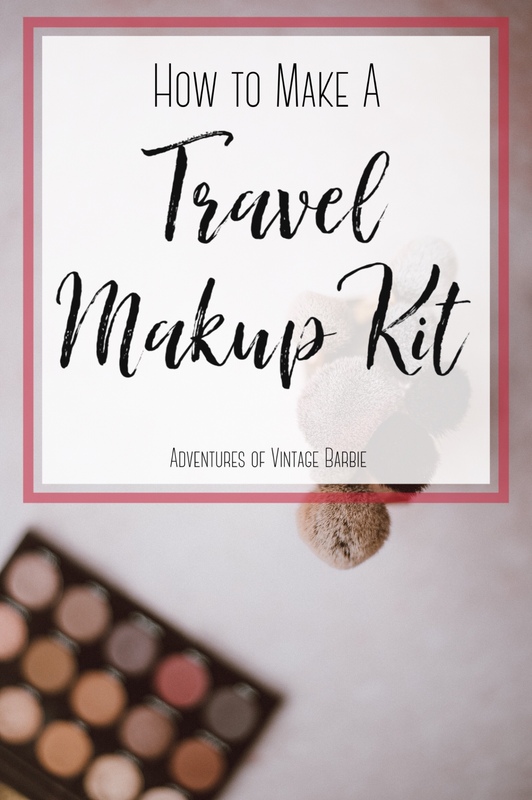 The vanity is up against the window so I can have natural light when I am doing my makeup. 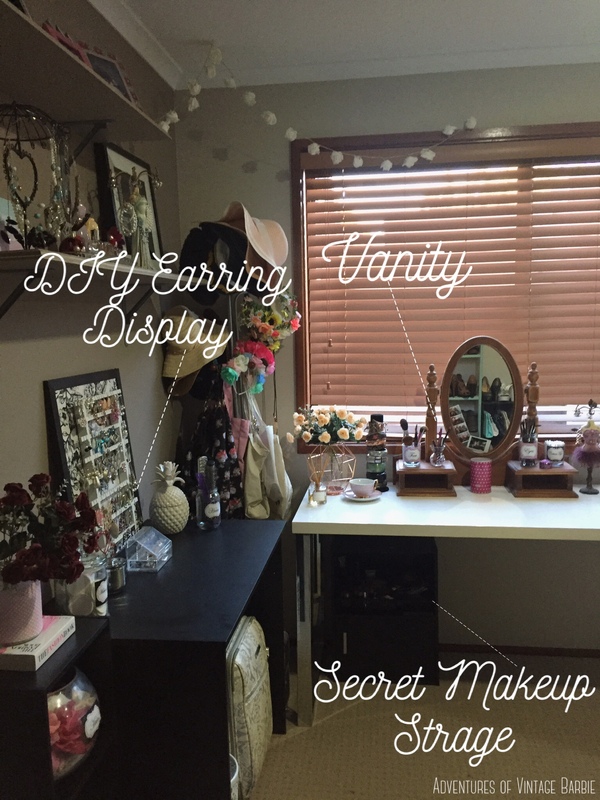 This shot is a good view of my vanity and how I use organisation as a way to display my favourite items. I am a firm believer of having things where you can see them as you are more likely to use them. I like to have everyday items in an easy to see location – such as my brush and comb. This is also true of the shelves on the wall. The bottom shelf has items that I use regularly as they are easy to reach. Also, because they are easy to see, I wear them more often. I have used a black rotating jewellery stand for my commonly used shorter necklaces (found on eBay for around $15). The to shelf is for photos and trinkets as I don’t need to reach them. 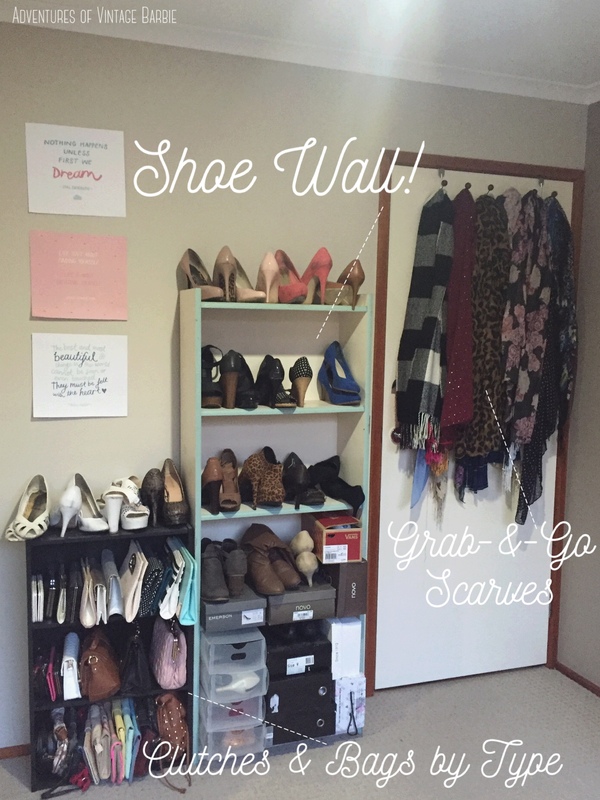 This is the fabulous shoe wall, along with clutches and scarves. The scarf holder is simply an over-the-door hanger with multiple hooks (Big W, $15) It makes it super quick and easy to grab a scarf before I run out the door to work in the morning. The dark bookcase is from Deals Direct and cost around $25 but is no longer available online. Similar ones can be found at Fantastic Furniture for $29. I’ve kept similar kind of bags together on this dark shelf, with clutches on top, larger side bags in the middle, and small casual side bags or envelope clutches on the bottom. I try to keep similar coloured shoes together, for example, pink tones on the top, black and blue on the next shelf, and so on. I clearly have more heels than space, which is why the less frequently used shoes are in boxes at the moment. I have used some clear boxes (3 for $14.95 from Howard’s Storage World) on a wooden bookcase from my parents house. If we turn to the left there is a full built in wardrobe with three sliding doors. The shelving can be changed, depending on what I have and what season it is. I have used various storage boxes to keep some items neatly kept away. I have two fabric boxes at the top of my shelves from Kmart ($8.50 for a pack of 2). I also bought the long plastic container from the dollar store for $7. I also place a bedside table with wicker drawers at the bottom of the wardrobe. I am unsure where these are from but I have seen similar ones at Kmart for $39. 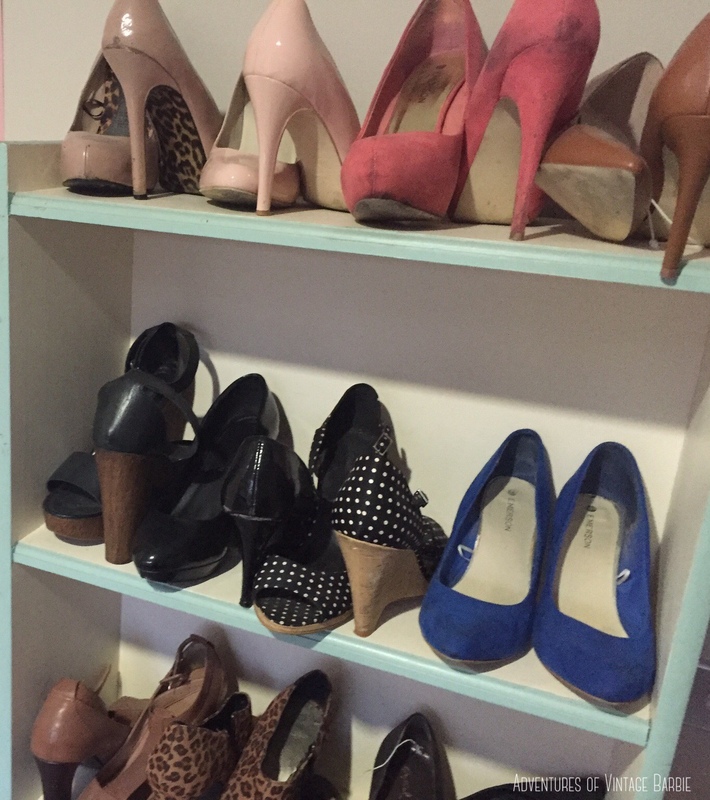 There is also a small metal shoe rack that I use for my flats (until I build my proper shoe wall!). 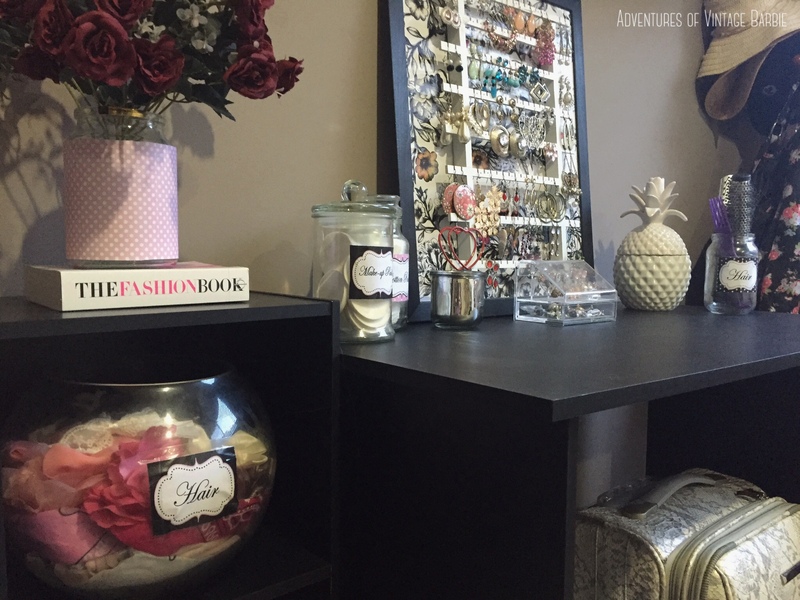 This shoe rack cost me around $15 from Big W.
It’s a very useful way to store my necklaces. The only problem is that I have so many necklaces, I have to put multiple ones on the single hook and they can often get tangled up. 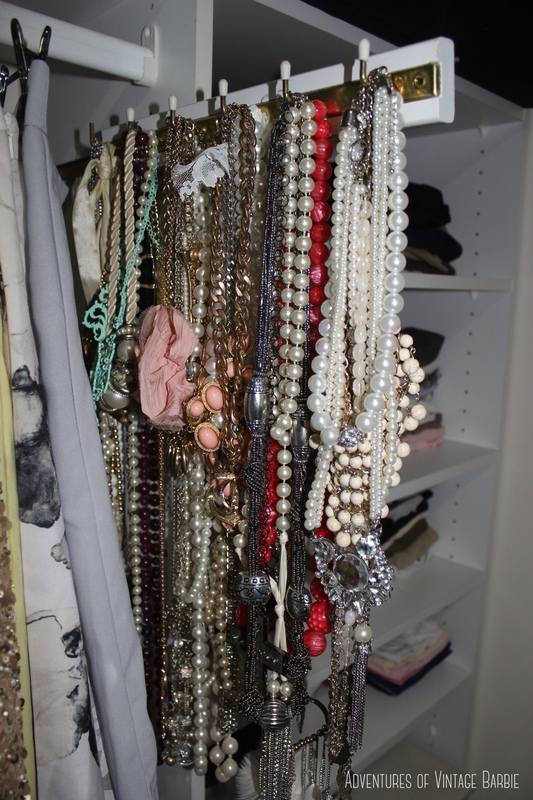 I’m still trying to figure out a way to effectively store my necklaces. Next to the necklaces are my skirts. 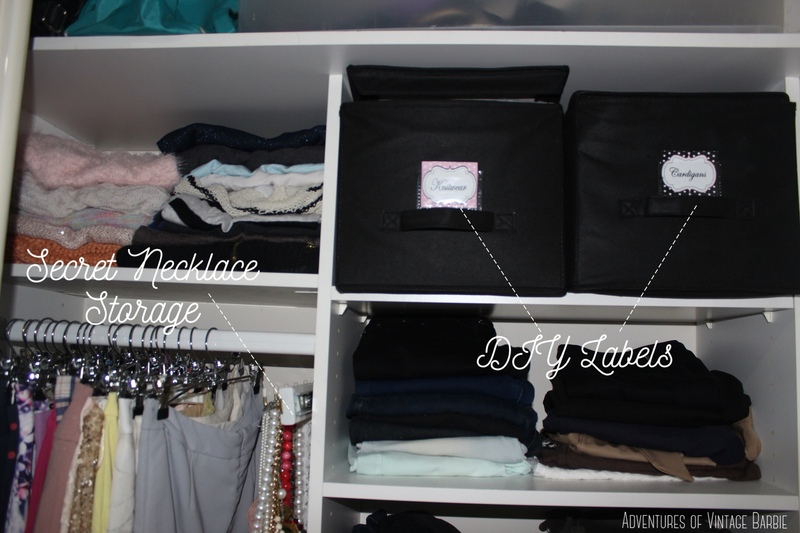 I made sure I used the same metal clip hangers for here as it makes it easier to keep everything neat and tidy when they are all the same hangers. They are from Big W and came in a box of 20 for $20 and a pack of 5 for $7. I’ve stored my handbags up the top of my wardrobe and to help them keep their shape I’ve stuffed old plastic shopping bags inside them. I’ve reused boxes from clothing stores to store my delicate formal dresses. These boxes are on top of my plastic drawers – the drawers cost around $20 from Big W.
I bought 2 sets of 10 wooden coat hangers from Target for $10 each. This keep my coats in shape and keeps them neat and tidy. Continuiting with my need for items to match, all the coat hangers used for my dresses are black plastic hangers. They are not all the same, but I hope to get black velvet coat hangers eventually, so this is just temporary. 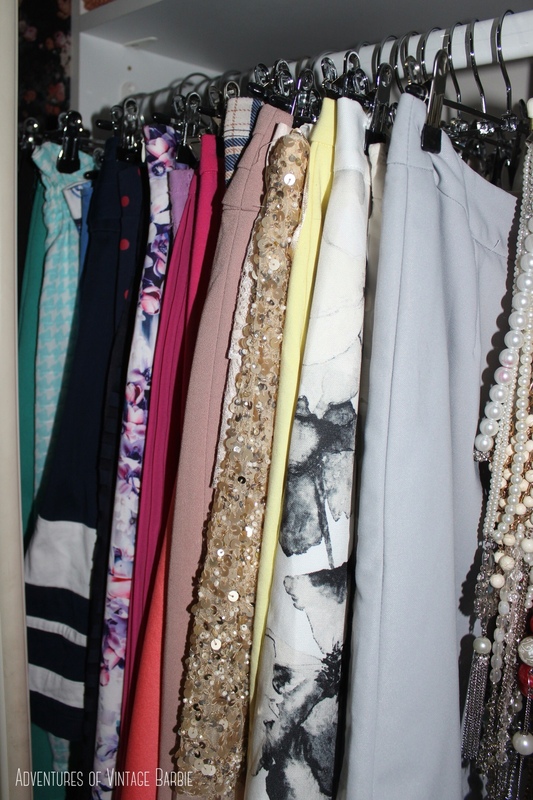 I have also organised my clothes by colour, which makes it super easy to find something I am looking for. 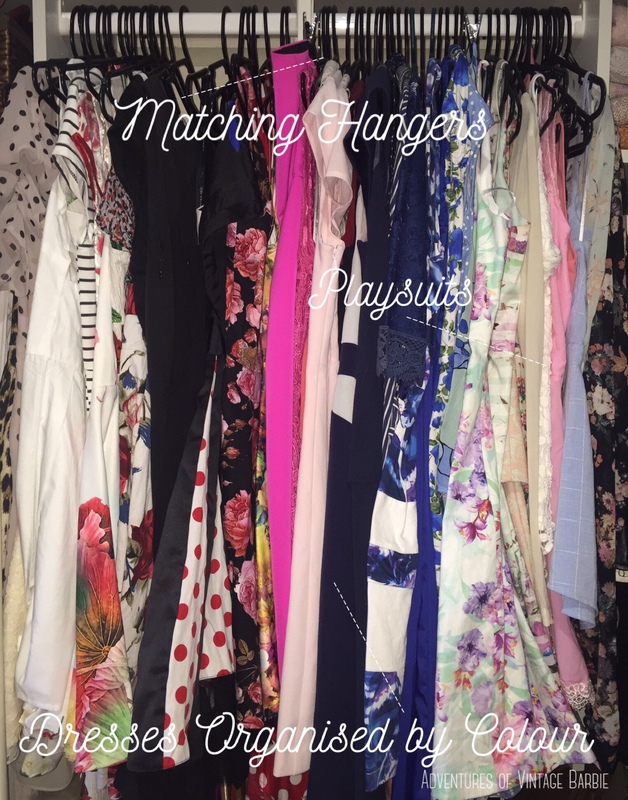 I also have my playsuits and kimonos at the right side of the dresses where there is just enough space for them. 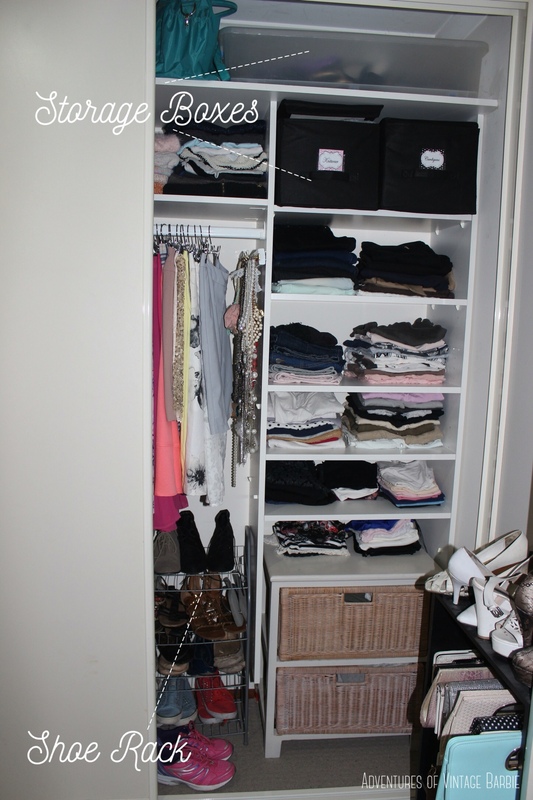 In the last part of my built in wardrobe I have used the space at the top to store things I do not often use. This includes fascinators, delicate items, and petticoats stored in boxes I have found at the dollar store. 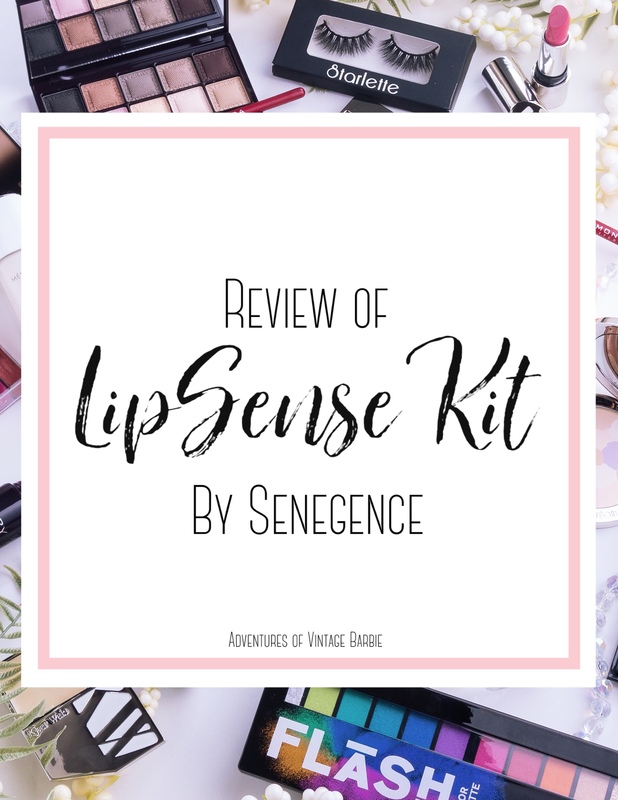 They range from $2 to $5 per box. I have installed my own extra rail for hanging shirts. This rail that I bought from Bunnings ($15.14) is 1cm too long for the space, which is why this rail is slightly uneven. 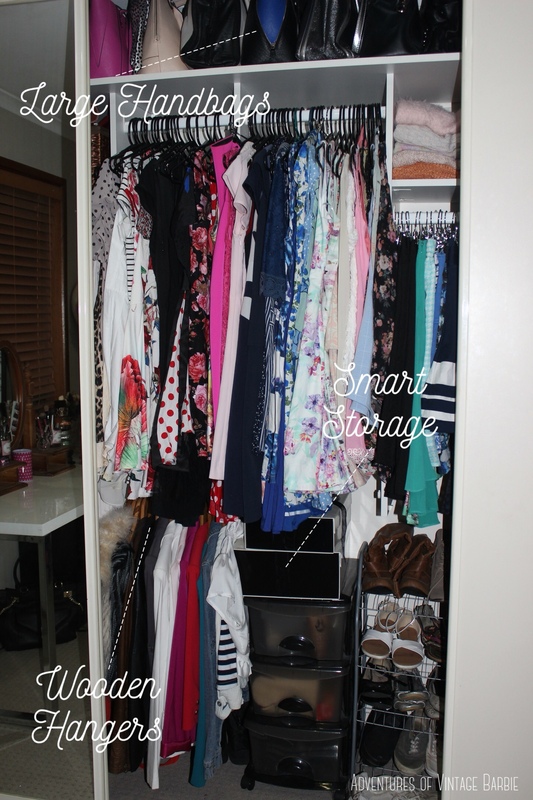 Once again I have used black plastics coat hangers from big w, the dollar store and Kmart. 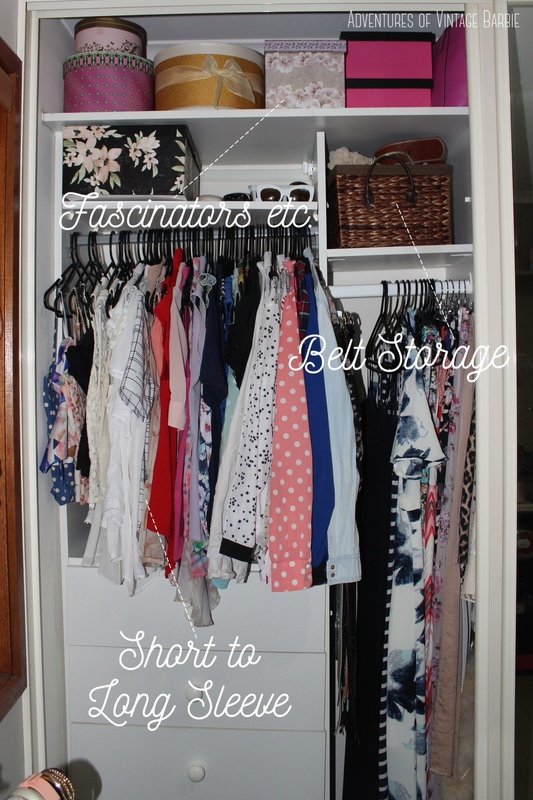 There are a few things that I want to change in my wardrobe room, such as adding a nice chair with cushions, getting a large rug, adding a chandelier ceiling light and using floating shelves for my shoe wall. 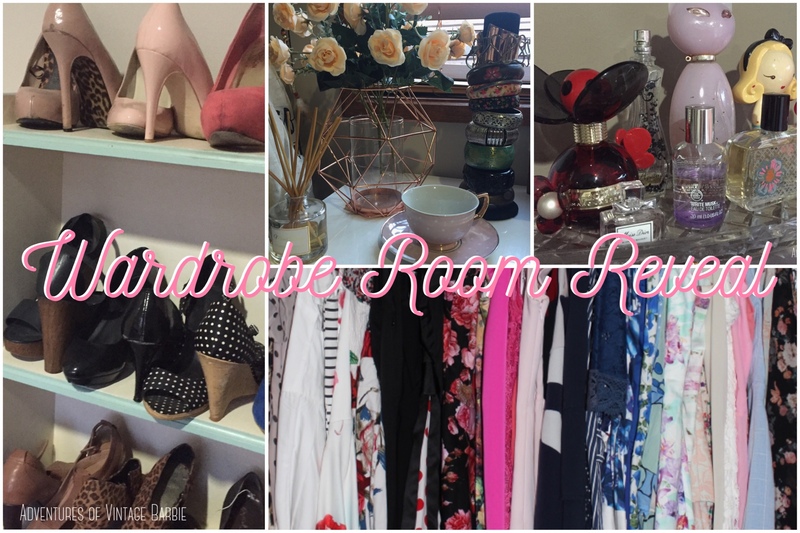 All of this will come in time and I will definitely share any additions and changes to my fabulous wardrobe room! What do you think about my wardorbe room? 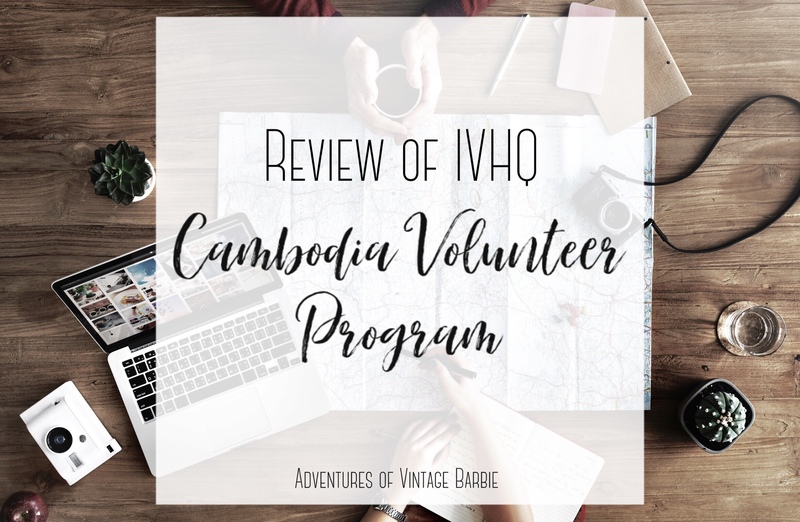 Post your thoughts in the comments section!